I like to wear leggings. I LOVE to drink Starbucks. I wear scarves all the time. I'm not really sure where this term originated, or when people decided to use it in a derogatory nature. Frankly, in my opinion it just goes to show how little creativity we have in this day and age. According to Urban Dictionary (the ultimate online database of popular knowledge), the word basic means: "an adjective used to describe any person, place, activity involving obscenely obvious behavior, dress, action." Literally mocking someone for being ordinary. We all have this intense urge to be different from one another. To have different likes, different looks and to participate in different activities. But it is almost getting to be so that if a person shares a preference or point of view that is considered "safe" or too common, they are ridiculed for it. Why can't we all just like what we want? If you want to wear Lilly for Target, go for it. If you want to be a rocker chick, do it. Or maybe just sweatpants today. You do you, girl. The need to put each other down for our choices is totally unnecessary, and frankly very rude. I don't comment on your (insert choice of self expression here), so please don't comment on my love of ballet flats. So, because I have been accused of being basic on numerous occasions, today I have decided to own it. I am basic. I am ordinary. But most of all I am Alex. I am with you! The term "basic" annoys me so much. I am all about starbucks and leggings, but I am also about a football tshirt and wedges with jeans. I shouldn't be "basic" for any of that. As you know, I also hate the term "basic" because people do use it in such a derogatory way. I'm basic, too, but I'm fine with it! Do you, girl! and I think you're anything but ordinary! I agree. I just think people have to pick on each other for every little thing. It's just ridiculous. It's always amusing to me how we're damned if we do and damned if we don't. Either we're basic or we're weird, either we're slutty or we're prudish. No in betweens and of course it's never okay to just be ourselves. I'm totally basic too girl. It shouldn't be derogatory if you ask me...haters gonna hate. lol. True. I always have to remind myself of that! That's very true! Just keep on doing what we do! Me too, friend. And the term "basic" really irks me, too. I like what I like because I'm me- not because I'm basic. It's the same as saying "white girl _____ " (wasted, basic, etc.). So irritating. I know! I hate stupid sayings like that. One, those aren't even original. You got me! Good job for making fun of my love of scarves!! You know what I mean? 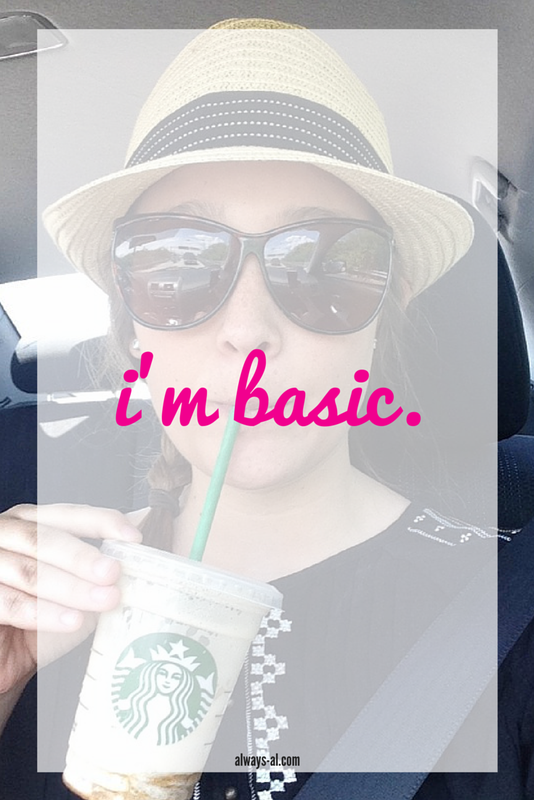 My fiance jokes with me about being basic too, but that doesn't bother me much. I really just think it's a funny term that someone came up with. I'm not really sure how people started to use it in a derogatory way.